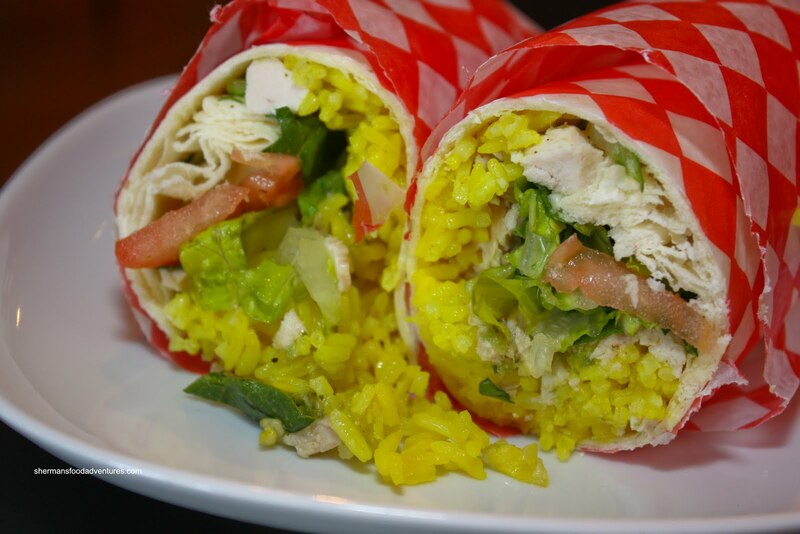 As much as Vancouver is famous for it's gastronomical diversity, Latin restaurants are poorly represented. Yes, there is a decent amount; but they are dwarfed by the endless selection of Asian restaurants. Furthermore, we seem to group Latin American food into one category (just like I did in my opening remark). But there are significant differences among Latin cuisine (as explained to me by Kim, who is from Panama). Thus, when I heard that there was this new Peruvian place from Blondie, I felt the need to try it. I asked Pomegranate, who spent time working down in South America, if he was familiar with Peruv ian food and he was not too sure. Just like the aforementioned differences, he was working in Columbia and he said the food ain't the same. 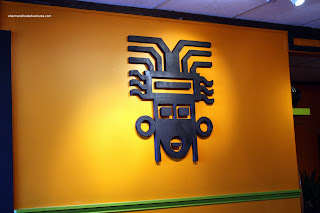 The only other "Peruvian" restaurant that I know of is El Inka Deli in Burnaby. Other than that, the other Peruvian experience has been in Portland at Andina. Now, to the those who have never heard of Mochikas, you will probably have a hard time finding it. Even if you had the address and a GPS, all you would find is Platinum Touch Auto Spa. Yah, rather than enjoying eats, you might believe you'd be r eceiving a deluxe wash and premium wax. You see, the restaurant is inside the car wash. Don't worry, you won't be eating with suds and a turbo air dry. It's actually at the front entrance tucked inside. Only a small banner at the front of the building hints at its existence. 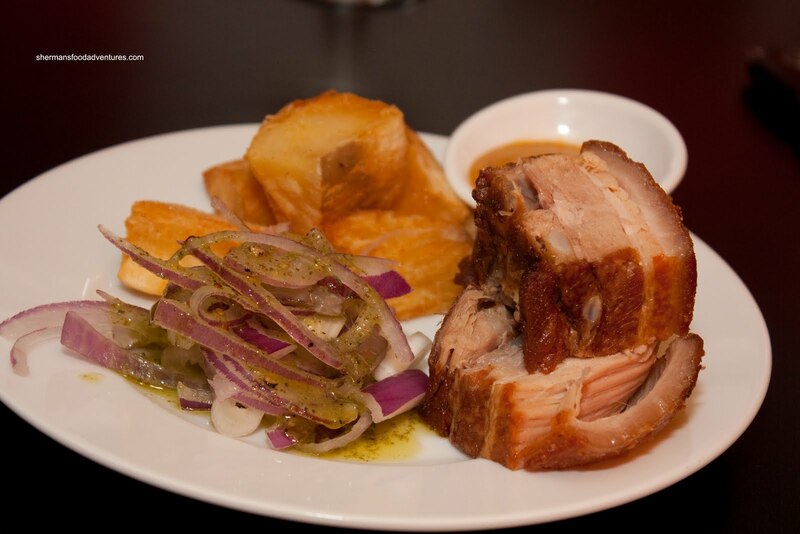 To our dismay, the dinner menu is not available at lunch, so there are only a limited selection of Peruvian dishes. So the only thing we could do was to order them all starting with the Butifarras Pork Sandwich, which is served on a hamburger-type roll. 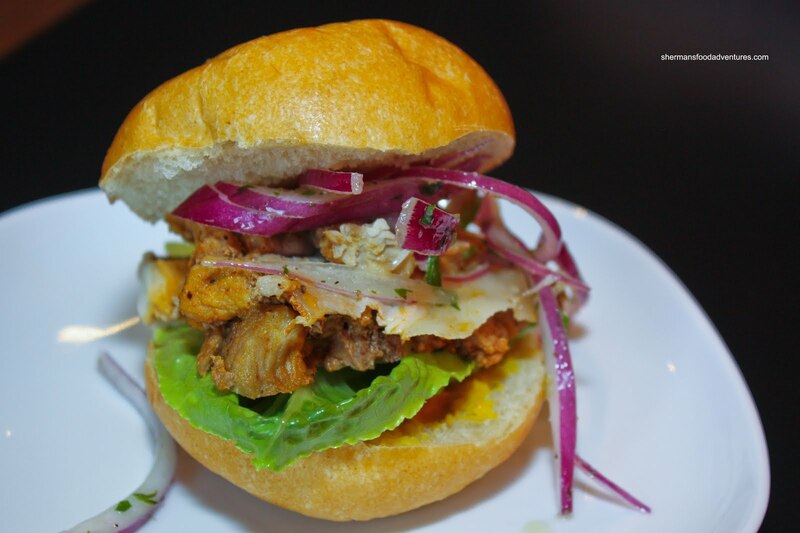 The meat in this sandwich is Jamón del País or Peruvian Country Ham, which in this c ase, is made in-house. It doesn't look like much; but this lil' sandwich was good. The "ham" is more like roasted pork with a nice spice coating. 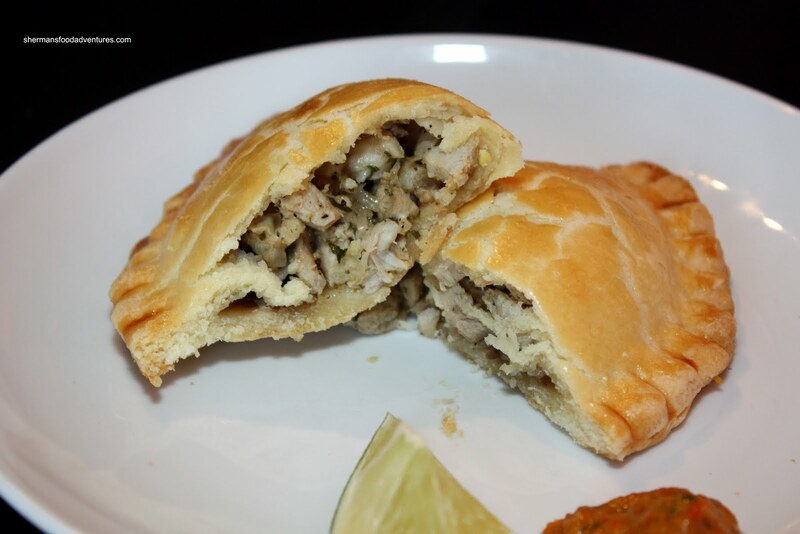 The texture was tender while still retaining a slight chewiness. It worked well with the red onions and mustard. We also tried the Chicken Empanada and were a bit confused how they reheated it. We didn't hear a microwave (which is a good thing); yet we saw them using some pot. Don't ask me how, but it came out hot and not looking worse for w ear. We liked the filling, it was full of chicken, black olives and hard-boiled eggs. I personally wasn't a huge fan of the pastry. It was somewhat doughy. 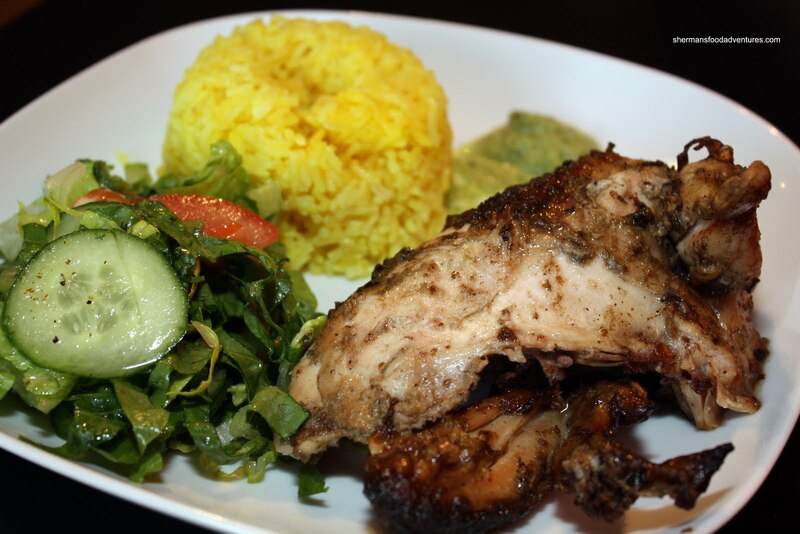 For my main, I chose the only one that was remotely close to being Peruvian which was the Pollo a la Brasa (1/4 Peruvian chicken with turmeric rice and salad). I ended up with the breast portion of the chicken and it was a bit dry (as expected). I did like the spices and had a hard time deciphering them other than cumin and pepper. Upon further research, there are spices in there I've never even heard of as in Huacatay paste and Aji yellow paste. Pomegranate ended up with something quite pedestrian in the Charcoal C hicken Wrap which basically combines what I ate into one package. It was good; but hardly representative of Peruvian cuisine. 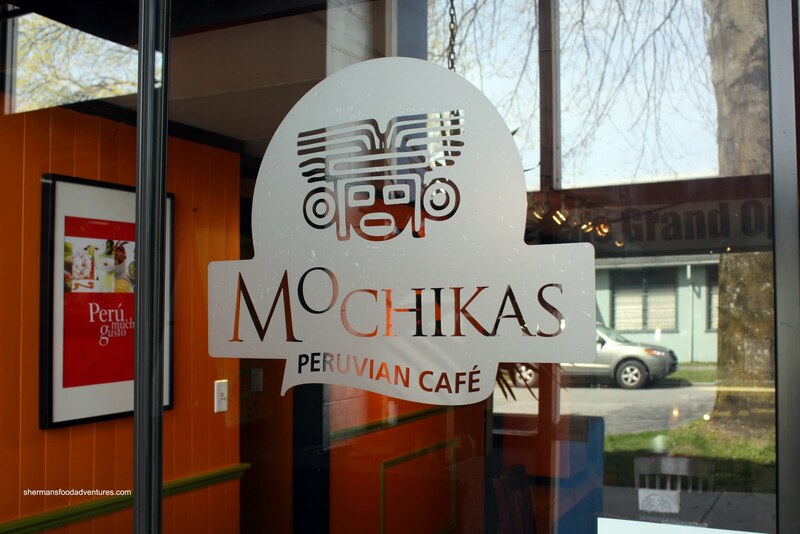 Almost a year later, I have returned to Mochikas to finally try their Peruvian specialties that were once not available on their lunch menu. I brough Mijune with me and we were treated to some delicious eats. We started with the Yuca Frita con Chicharron which is deep fried cassava root & pork belly served with Mochikas signature sauce. Unlike some other versions of chicharron, this one was much more like a Chinese roast suckling pig. The meat was very tender and there was only a modest amount of fat. I thought that it had a nice rich roasted pork flavour that was best to be enjoyed without any condiments. The fried cassava root were in fairly large chunks and were predictably fibrous and starchy. They were fried up nicely with a crisp exterior. The accompanying sauce was creamy, a little peppery and with some underlying heat. Lastly, there was a side of pickled red onion that I didn't touch since my stomach doesn't agree with it. I would have; but Mijune would have to put up with a lot of issues... Moving along, we had the Ceviche next consisting of fresh sole with mixed seafood marinated in lime juice, garlic, & cilantro served with corn, sweet potato & red onions. 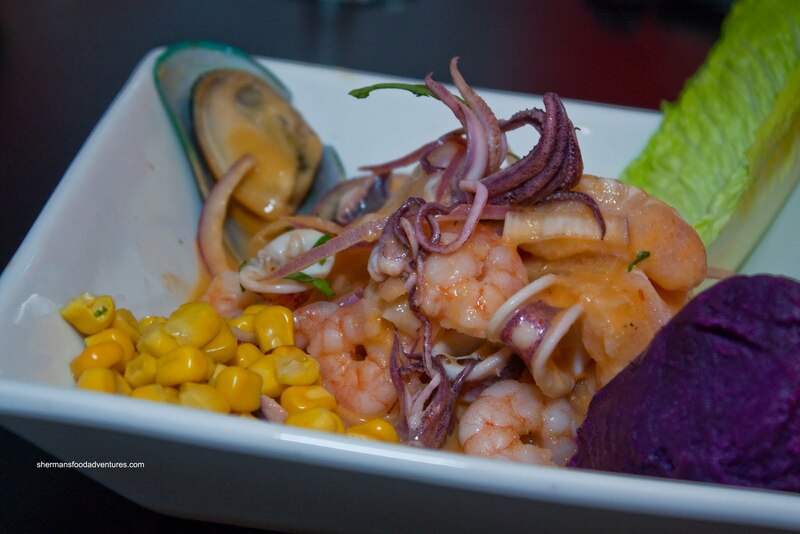 It was explained to us that the base of the ceviche was a broth consisting of ginger and veggies. That added a nice kick and complexity in addition to the lime, garlic and cilantro. The marinade was so darn tasty, we wanted to drink it. It was so smooth! The fish, squid and baby scallops were tender and sufficiently "flavoured" while the shrimp were a bit of a letdown. But in general, a very good ceviche. 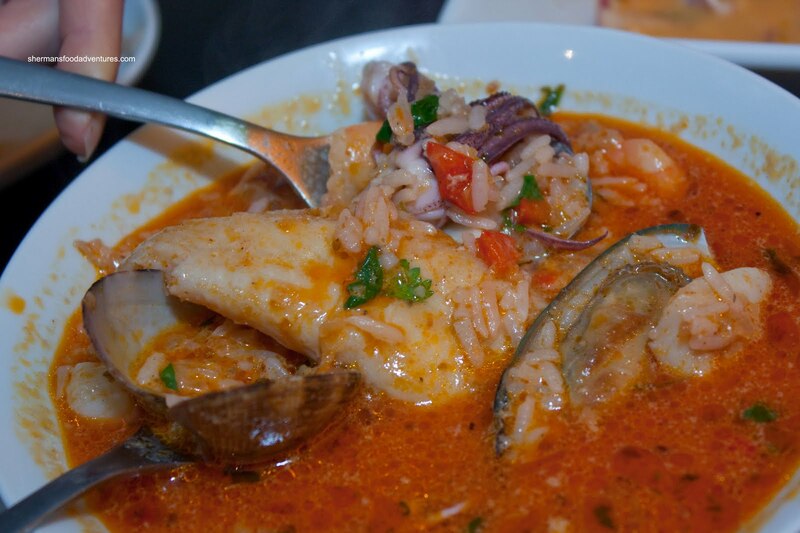 Now for what would be considered a "wow" dish - Chupe de Mariscos. What amounts to a spicy, hearty seafood chowder with Aji Panca, fresh cheese, rice, & cassava, we agreed it was a cross between a Paella-soup and a Peruvian Laksa. The darn thing was so freakin' tasty. A complex combination of flavours, it was sweet, a bit spicy, a touch creamy (and oily) due to the cheese and full of seafood flavour. Despite the oil slick on top, it didn't feel heavy to eat. There was so much stuff in it, it could easily be a soup that eats like meal (hey, where have we heard that before?). 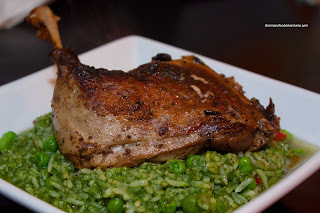 From my last visit, I'd been thinking about the Arroz con Pato since. The thought of 6-hour braised duck marinated in Aji Amarillo, Peruvian spices & beer served with cilantro rice sounded too good to pass up. In the end, it was not bad; but not didn't wow me like the chowder. 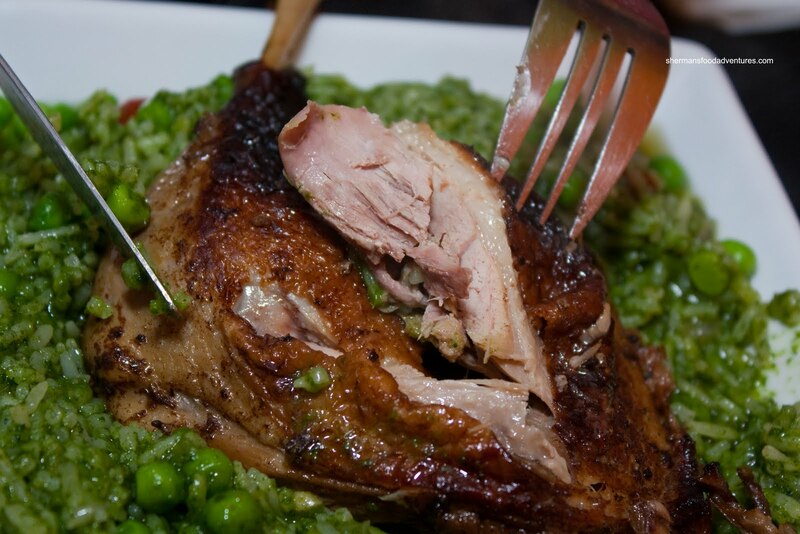 However, if we isolate it without comparisons, the duck itself was pretty tender; yet slightly dry. I liked the smokiness and deep flavour of the duck while the skin was nicely rendered. I'm not a huge fan of cilantro; but the rice was very good. Just enough flavour and not mushy, I wanted to keep eating the rice, especially with the little sweet peas strewn throughout. Wow. On this return visit, I finally got to experience what Mochikas is really about. And man, do I ever like it. Definitely something out-of-the-ordinary that finally sets itself apart from the boring chain restaurants that litter the Vancouver dining scene. Furthermore, it is not another Asian restaurant. Hey, I love Asian food; but honestly. There is one on every street corner. The food, the flavours and the execution are very impressive considering the venue and limited kitchen. The proprietors are very nice people who care about their business and their customers. The odd location adds a bit of charm and if you really needed your car detailed, you can eat while you wait. "but they are dwarfed by the endless selection of Asian restaurants"
I think the real question is, what -isn't- dwarfed by the endless selection of Asian restaurants around here? I find Vancouverites tote around the "diversity" name a lot, when really, it's just predominantly Asian this and thats. I don't mind this at all of course, but it's good to see that we have some actual diversity as well : ) Great find. While I was there, I did think that "Kim really should be here". Yah, I suggest you go on the weekend and during dinner time to try out the real specialties. Yen, I can't agree with you more. Everyone boasts about our diversity, but in reality, it's mostly diverse Asian food. With that being said, I enjoy it, much like you. It's just too bad that some cuisines are poorly represented. And that's just due to the population base. yum ... this will be on my list. I've been to Peruvian restaurant here in Vancouver East .. er correction.. Chinese dishes cooked by ex-Peruvian chefs. There are not many families emigrated from Peru to the LML; the ones I met are of Chinese ethnicity and they are refine. Yen, I think it has to do a lot with the culture itself wanting to express themselves. Take for instance, Filipinos; they are one of the largest immigrant communities around, yet you barely see them. The roast chicken and the wrap remind me of the Peruvian food I tried at the Taste of the City held at the PNE last year. Wonder if they are the same owners? I remember the chicken being delicious. I will definately be checking out that marinated duck dish! Sounds unique. Thanks for the tip. But in terms of culture in general, we're a lot less diverse than we claim to be. We still do a fair bit better than other cities and countries worldwide, but when it comes down to it, it's less "true multiculturalism" and more "every ethnicity you can find in Asia" [and a handful from the Middle-East]. 1. I'm not looking hard enough. 2. They consider themselves Canadian. But now I'm getting off topic. Yen, again I am in your court regarding the perceived notion of Multiculturalism. It's definitely more like "Multi-Asianism" for sure. But as u and Kim remarked, there are other big ethnic groups; yet they r poorly represented foodwise. Grayelf, I totally agree with you. Very promising. It's only too bad that I didn't get to try some of their Peruvian specialties. I'm definitely returning for that. The first time they run out of fod and they weren't as friendly as they should have been, but I thought they deserved a second chance. On my second visit I enter the room and the person in charge point it at a table and I sat there with my girlfriend. He didn't really talk much in fact he seemed a bit depress, which is a surprise because me being Peruvian I expected a more friendly welcome. -Different menu with some tasty dishes( I wish they had more). So who is better? Inka Latin Deli or Mochika? I really hope they improve. Fun tip: Peruvian Chicken its actually 2 times bigger than Canadian chicken. The pollo ala brasa recipe here is the one you tasted at eat, the recipes is the owners recipe. They do have a rotisserie in Vancouver for making the chicken properly, I'm not sure if it is currently in the hands of the owner of this restaurant, traditioanlly it is a wood smoked rotiserie chicken. I have to say i'm not really fully happy with el inka, or mochikas, they each do a bit decently, but neiher offers the entire package. El inka will never change, Mochika's i'm not sure, if Pedro does well im sure he can get something in a better location in the future, all the best to him. @Kevin I am not going to disagree with you there. I'm pretty sure El Inka and Mochikas gets away with whatever they do because there are not really anything to compete nor show us anything new. That's what happens when there are so few restaurants of a certain ethnicity. With that being said, I like Mochikas for what it is and am not really concerned with any authenticity issues since I've never been to Peru myself.